I find urban development and the historical evolvement of a city an interesting subject. In Hagalund, Solna, a suburb reached quickly by rapid transit or by the Stockholm underground, one finds a neighborhood bearing witness to what went through the minds of Stockholm city planners during the 1960’s. 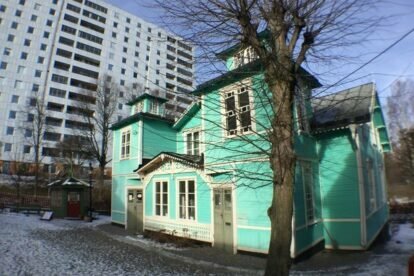 At the turn of the 19th Century a small suburb sprang up as a result of a severe housing shortage in Stockholm. It became a popular area amongst craftsmen to build their own houses using wood and other cheap materials not allowed in the more regulated inner city. This made for a creative and colorful mix of buildings together forming a small town in itself with its own railway station and church. By the end of 1960’s it was decided that the houses would be torn down in order to give space for an urban development more in “harmony” with the times. An era had come to end and today only a handful of the original buildings remain. Eight blue imposing high-rises dominate the landscape, today a sad reminder of the shortsightedness of bygone technocrats. If not for the naïvist painter, Olle Olson, who documented his life spent in Hagalund, the collective amnesia would be total. In Hagalund the house where he was born and where he spent most of his adult life painting, is today a nice little museum open to the public. The contrast between the few original buildings and the blue towering monstrosities gives food for thought.